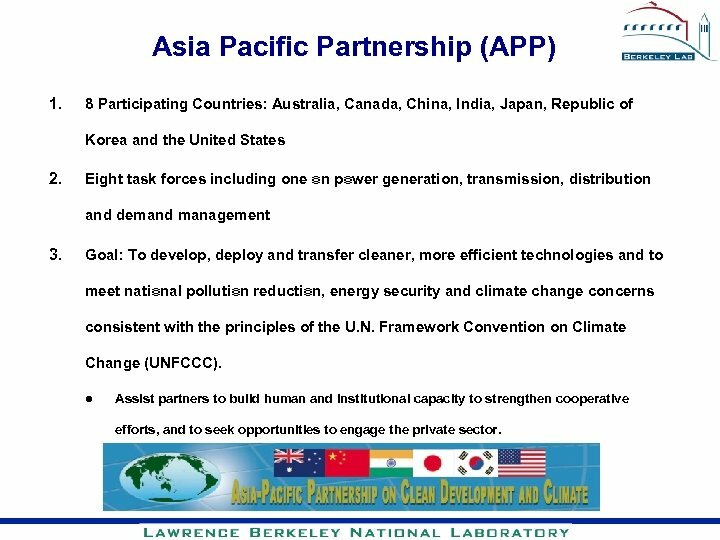 Asia Pacific Partnership (APP) 1. 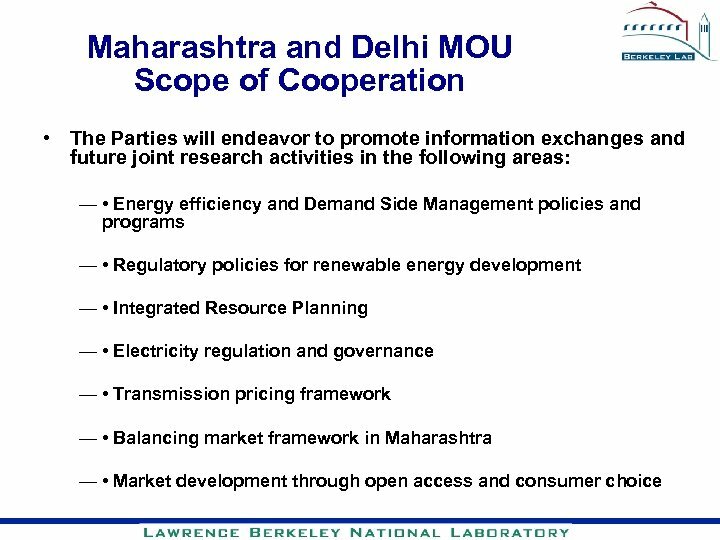 8 Participating Countries: Australia, Canada, China, India, Japan, Republic of Korea and the United States 2. 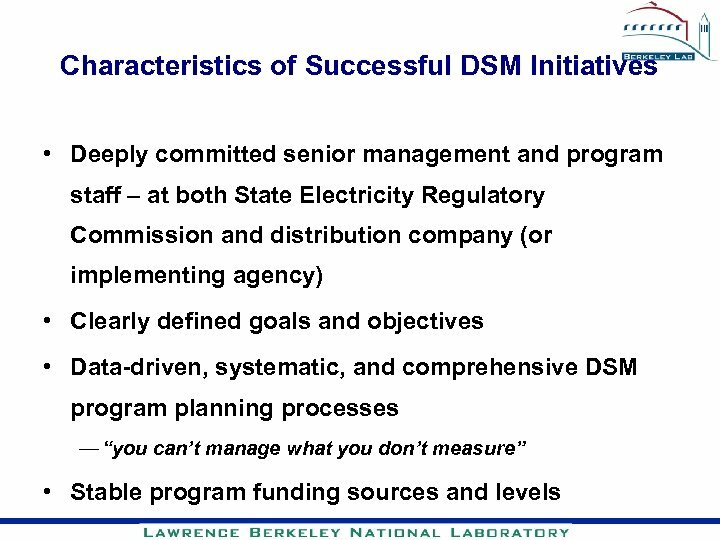 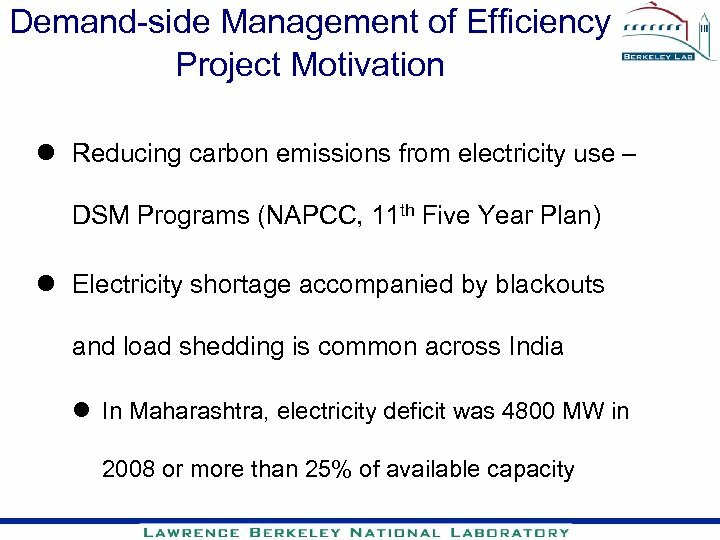 Eight task forces including one on power generation, transmission, distribution and demand management 3. 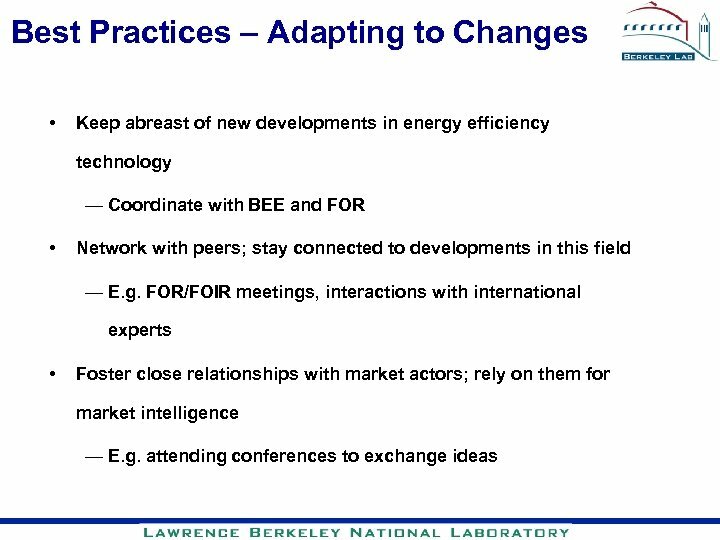 Goal: To develop, deploy and transfer cleaner, more efficient technologies and to meet national pollution reduction, energy security and climate change concerns consistent with the principles of the U. N. Framework Convention on Climate Change (UNFCCC). 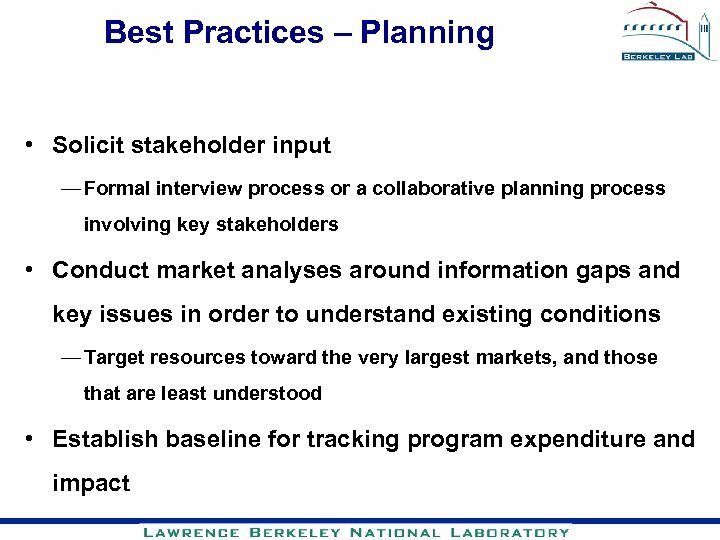 l Assist partners to build human and institutional capacity to strengthen cooperative efforts, and to seek opportunities to engage the private sector. 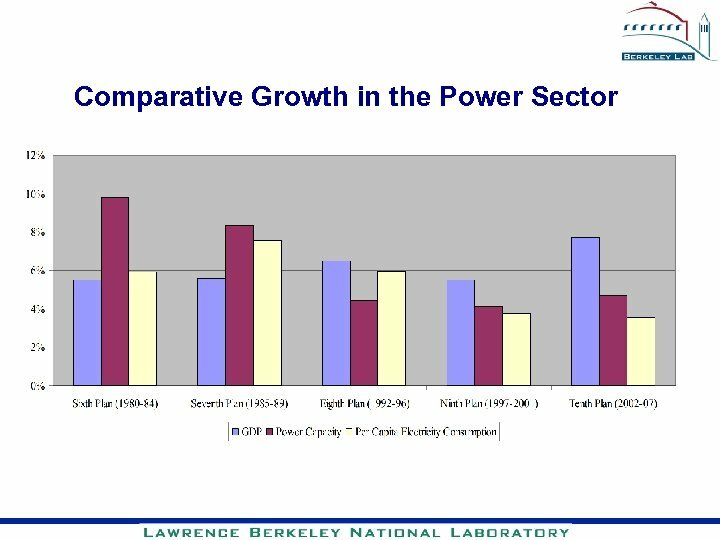 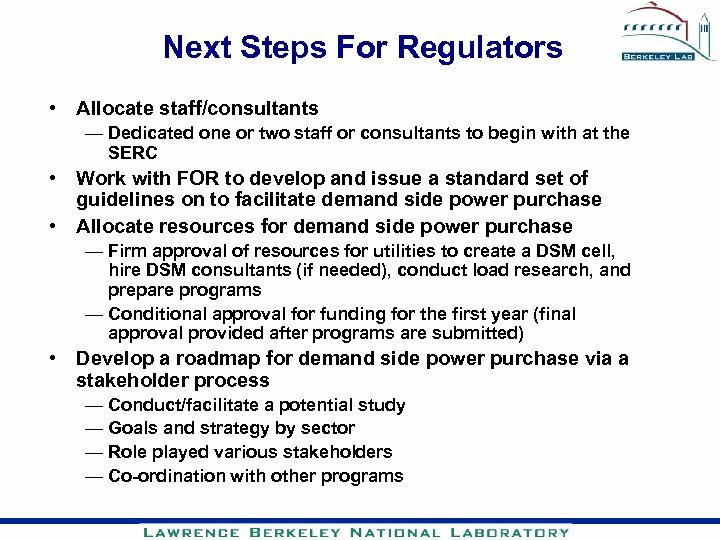 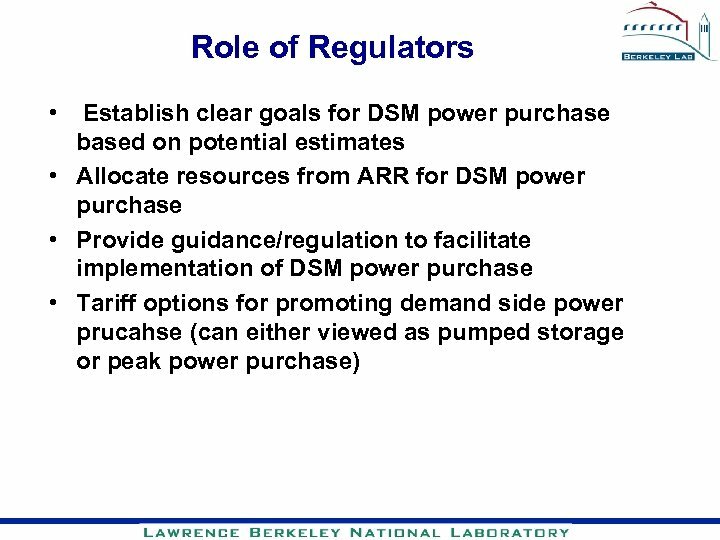 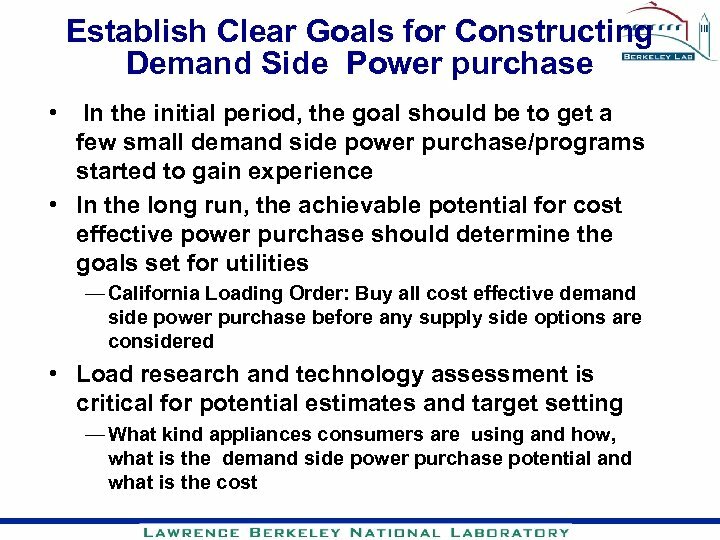 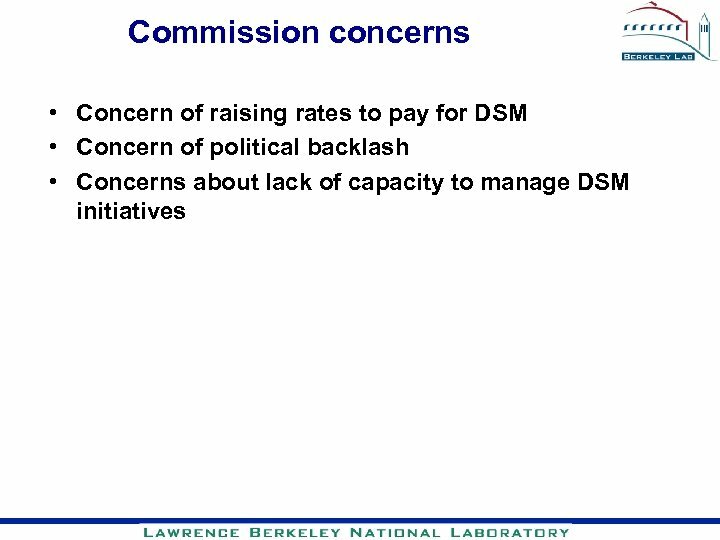 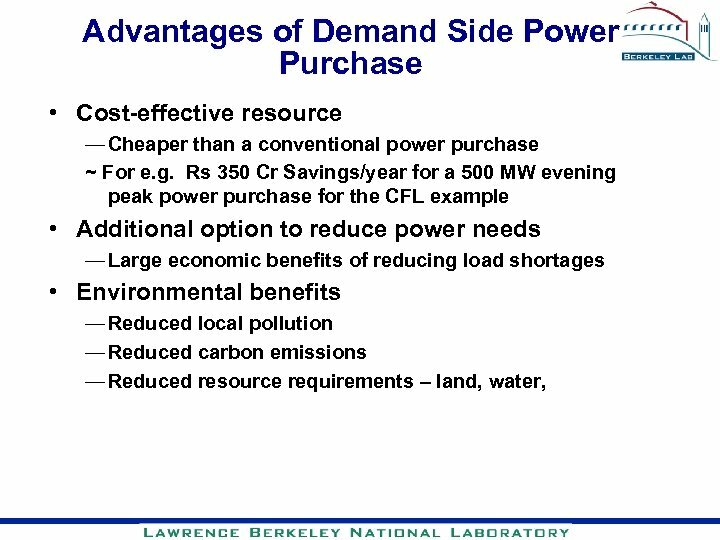 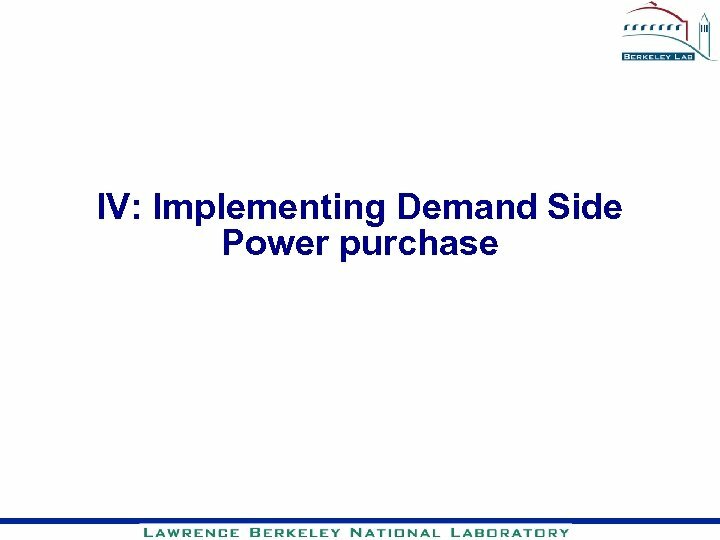 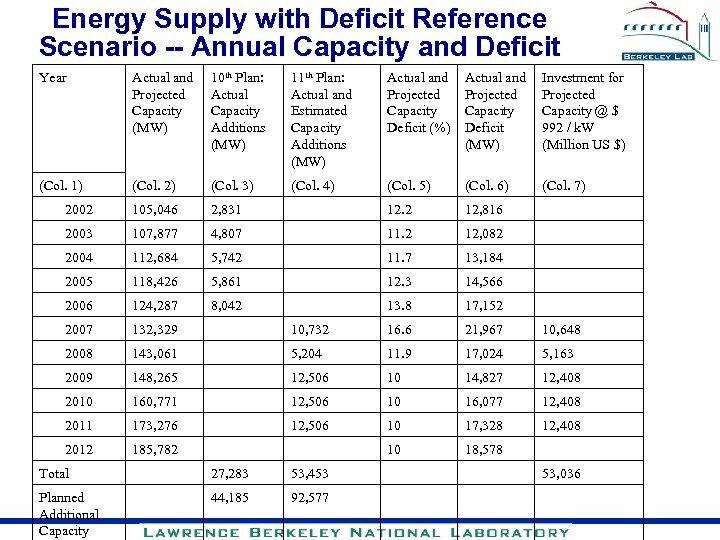 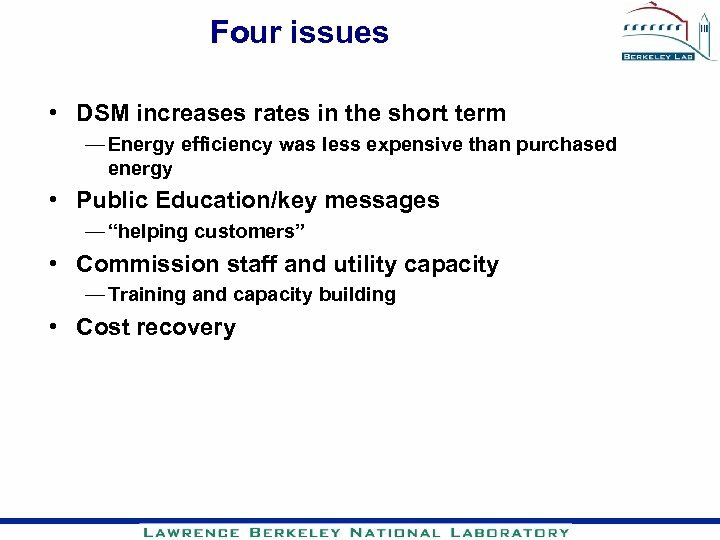 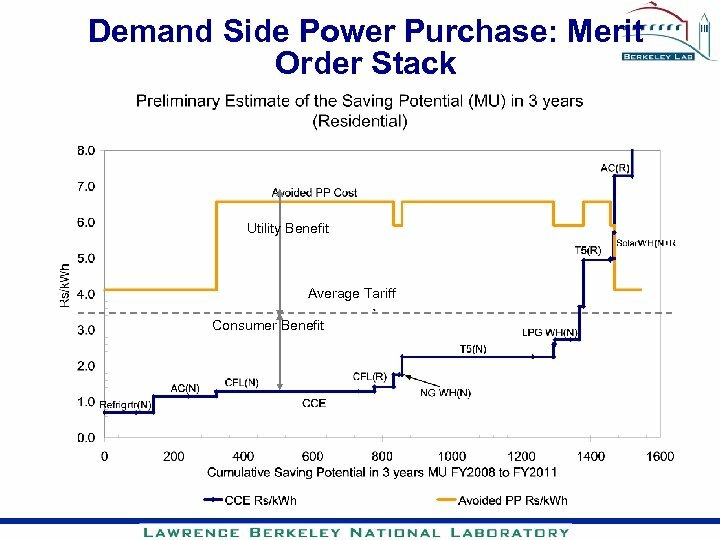 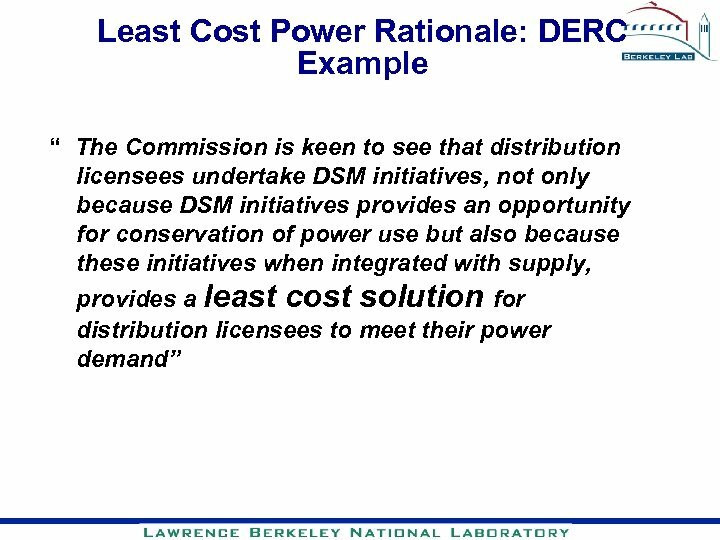 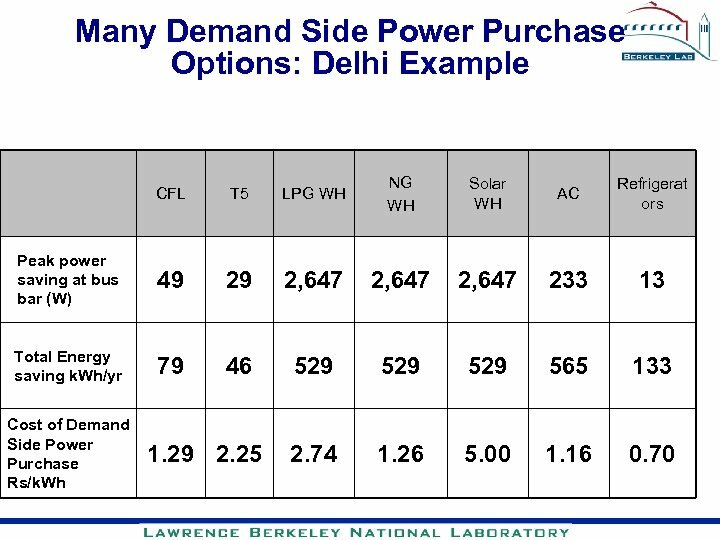 Demand Side Power Purchase: Basics Demand side Power Purchase is a bundled set of energy efficiency (EE) programs that are designed to deliver the energy and capacity equivalent of a power purchase on the supply side. 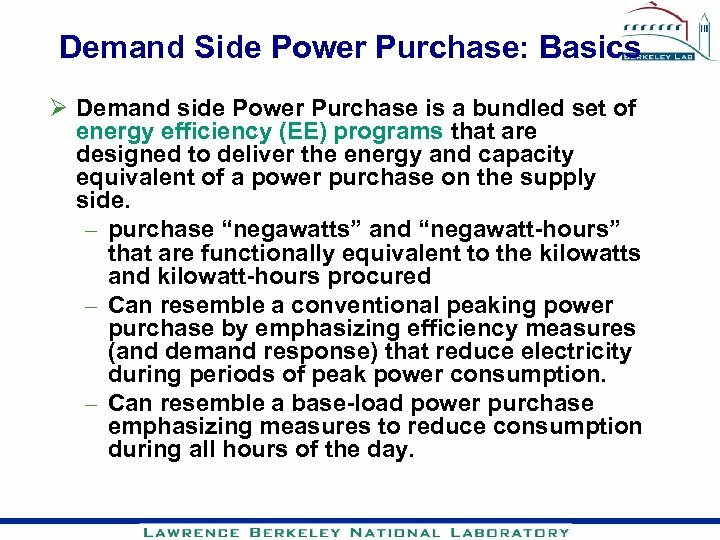 – purchase “negawatts” and “negawatt-hours” that are functionally equivalent to the kilowatts and kilowatt-hours procured – Can resemble a conventional peaking power purchase by emphasizing efficiency measures (and demand response) that reduce electricity during periods of peak power consumption. 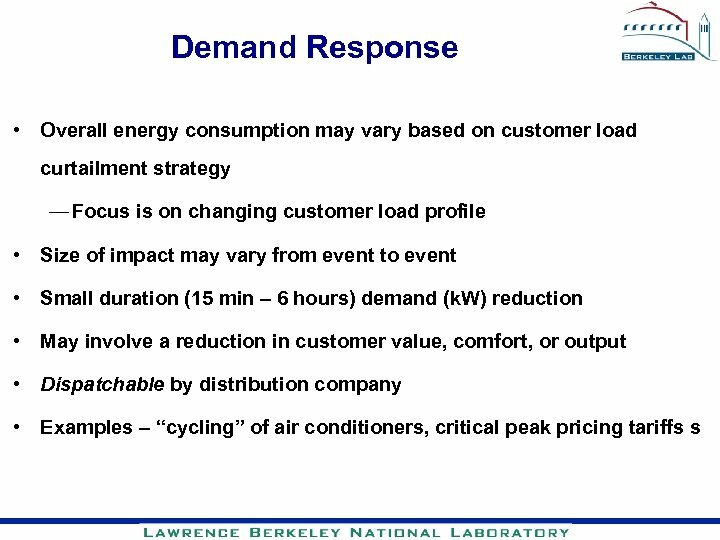 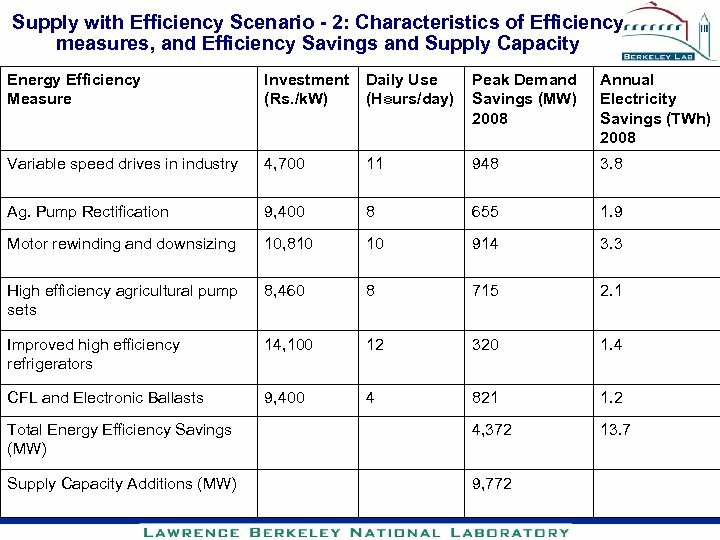 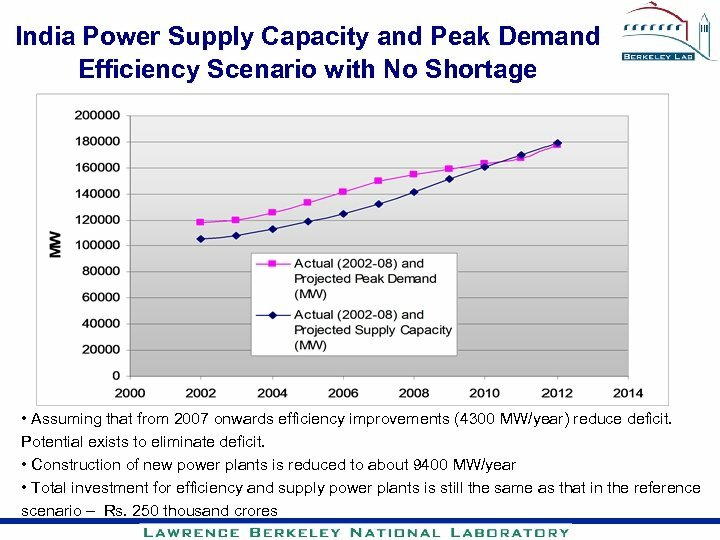 – Can resemble a base-load power purchase emphasizing measures to reduce consumption during all hours of the day. 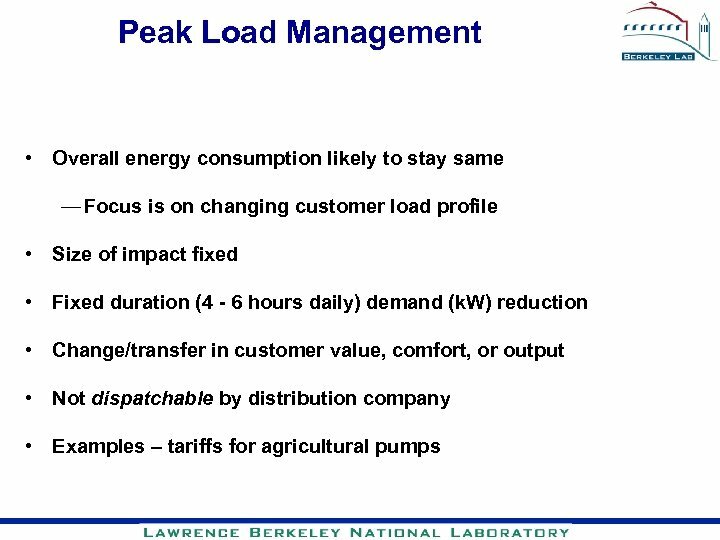 Will you Approve This Peak Load Power Purchase? 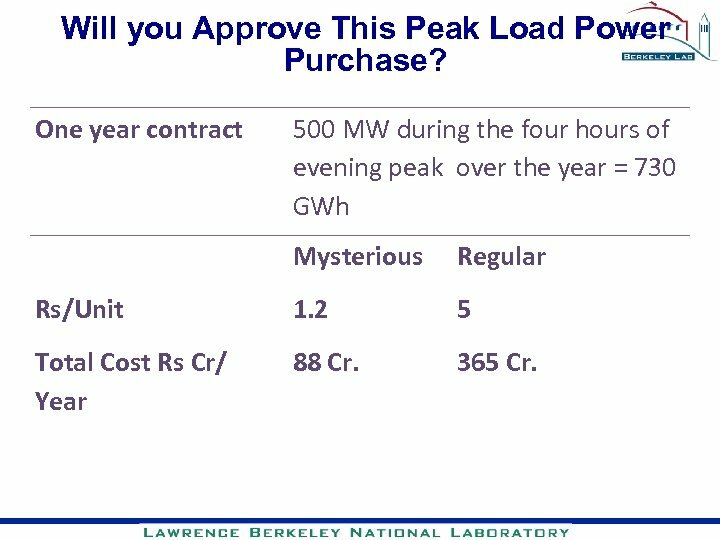 One year contract 500 MW during the four hours of evening peak over the year = 730 GWh Mysterious Regular Rs/Unit 1. 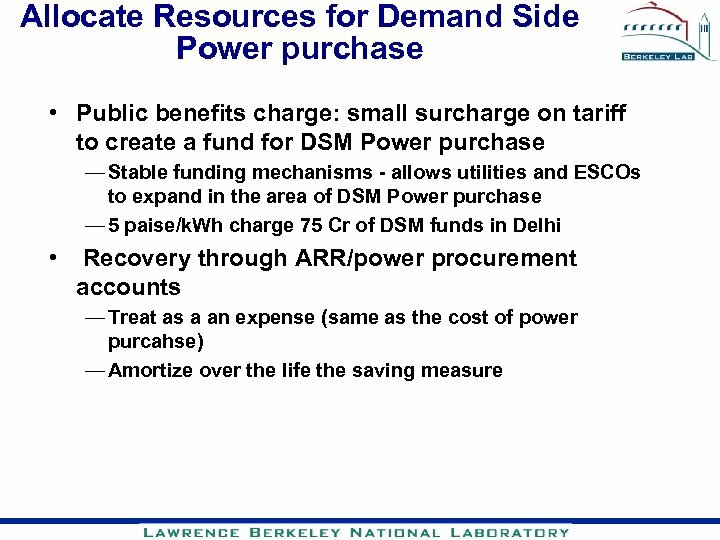 2 5 Total Cost Rs Cr/ Year 88 Cr. 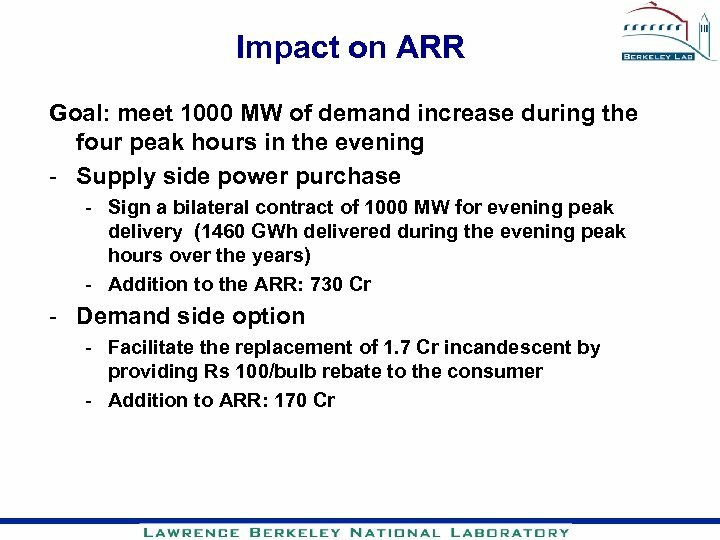 365 Cr. 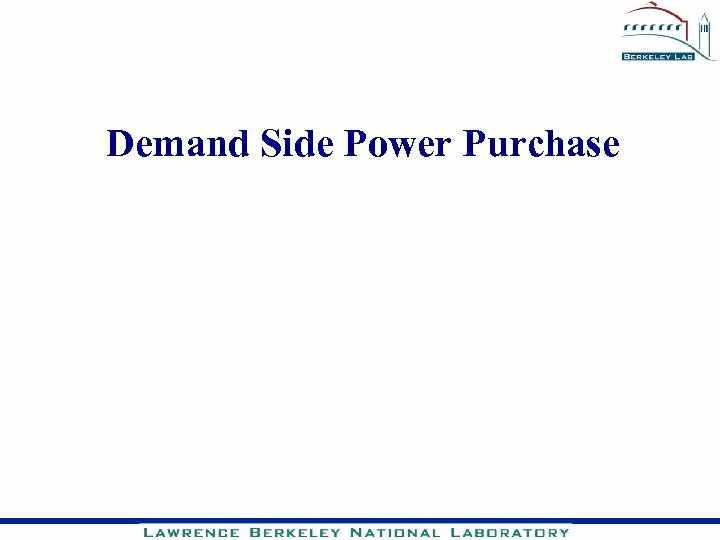 What is this Mysterious Power Purchase? 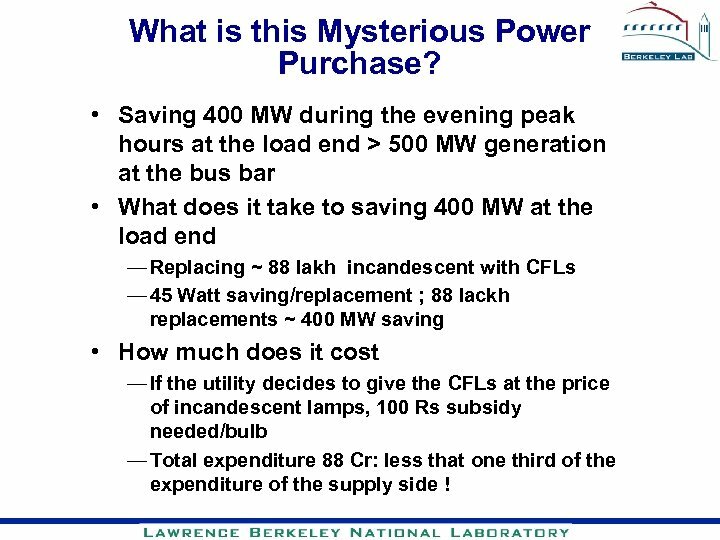 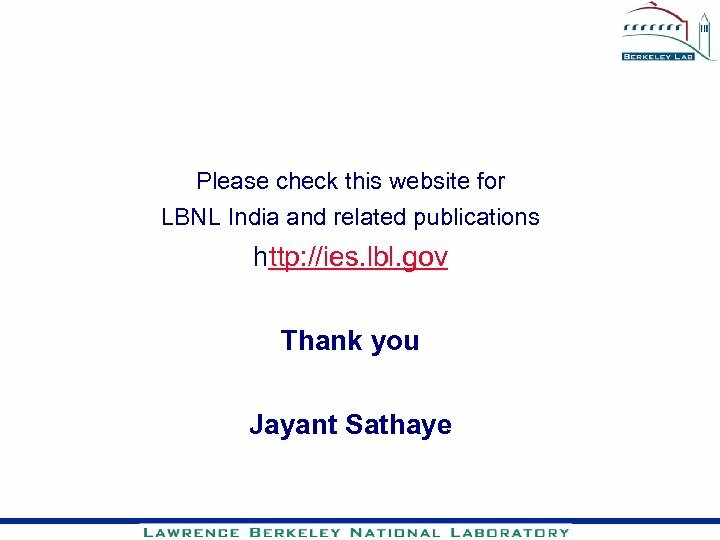 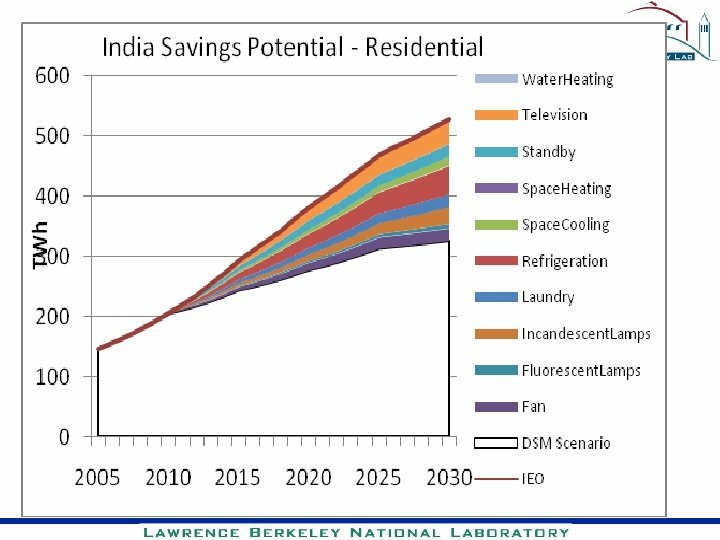 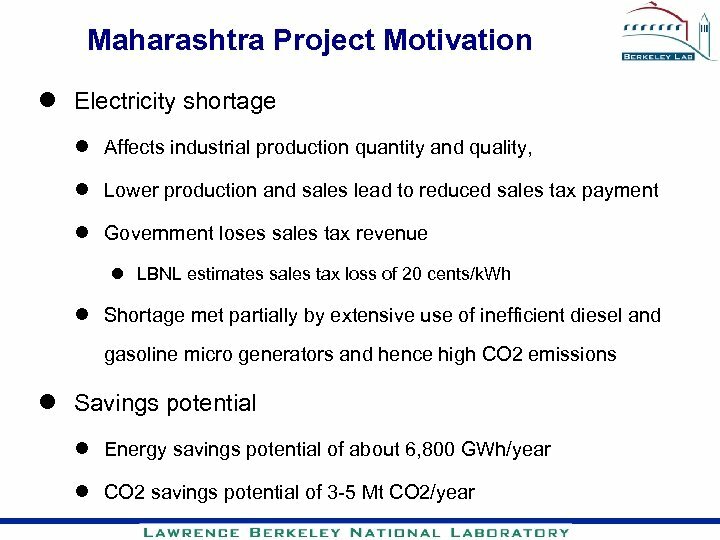 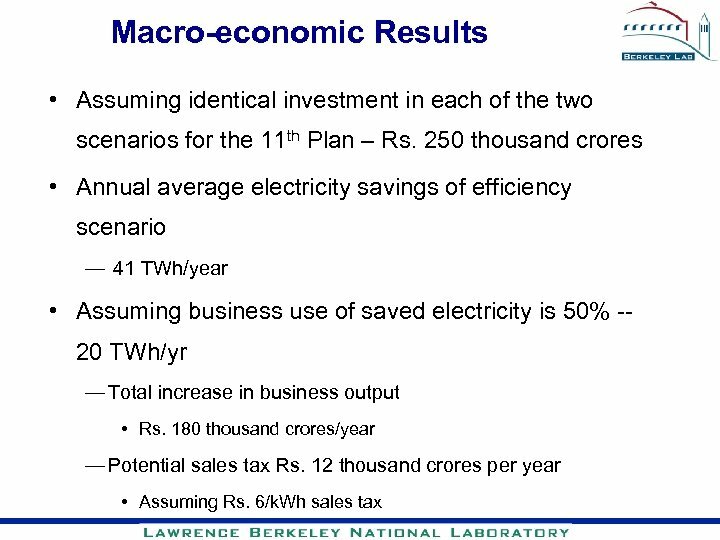 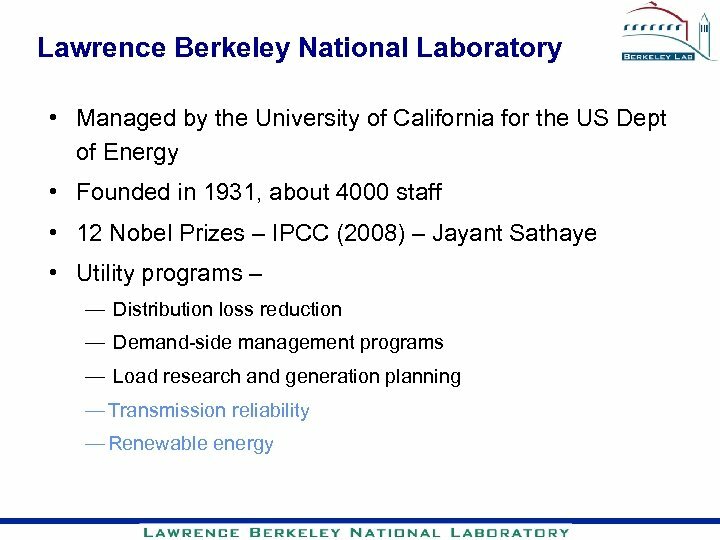 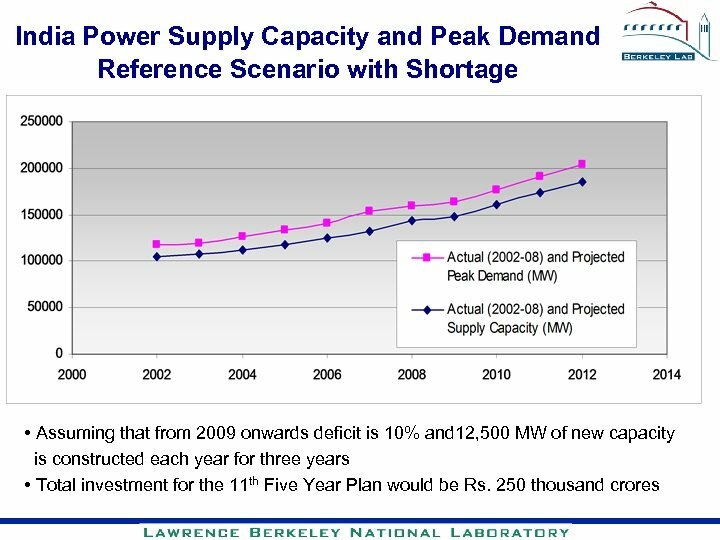 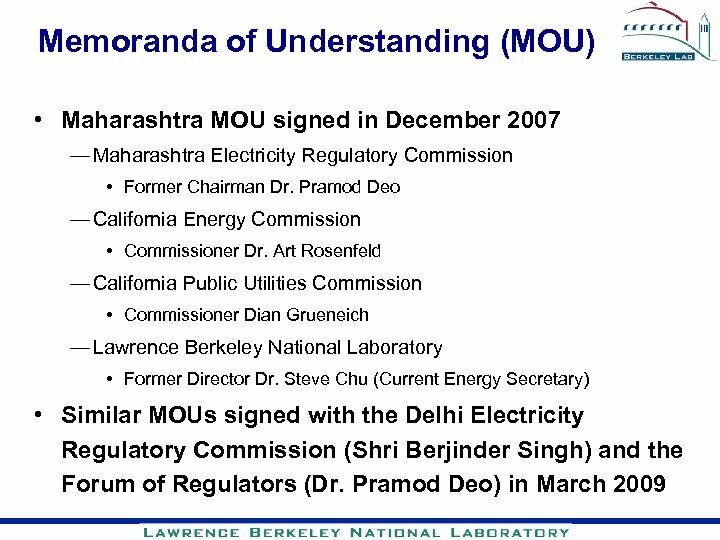 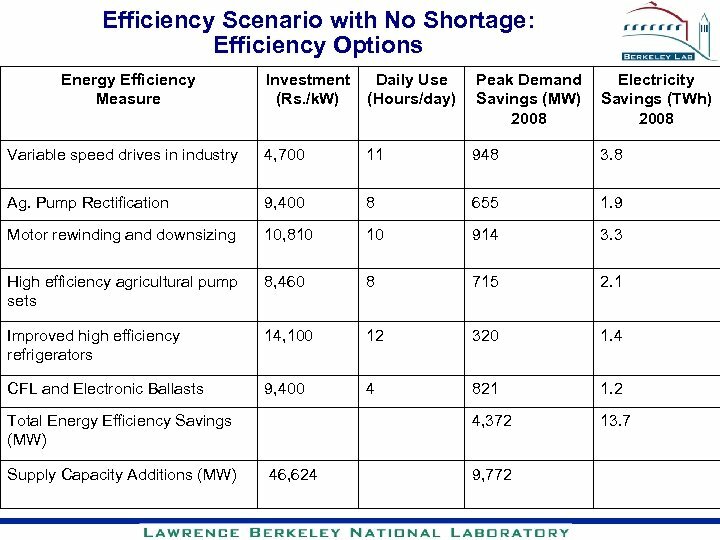 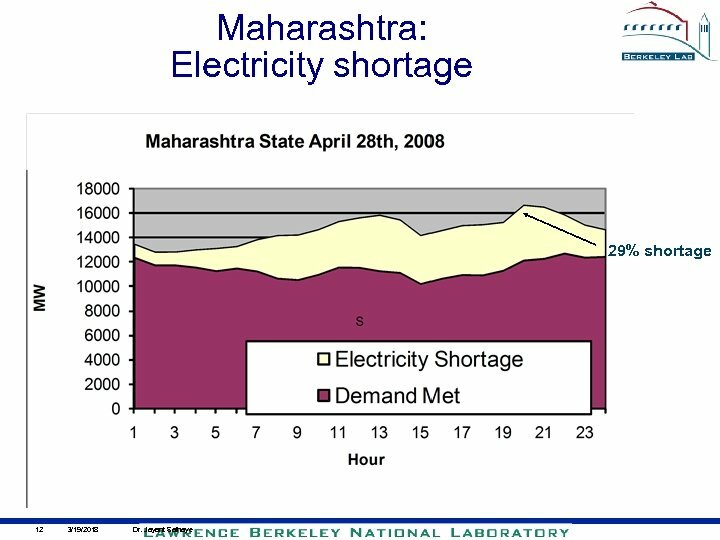 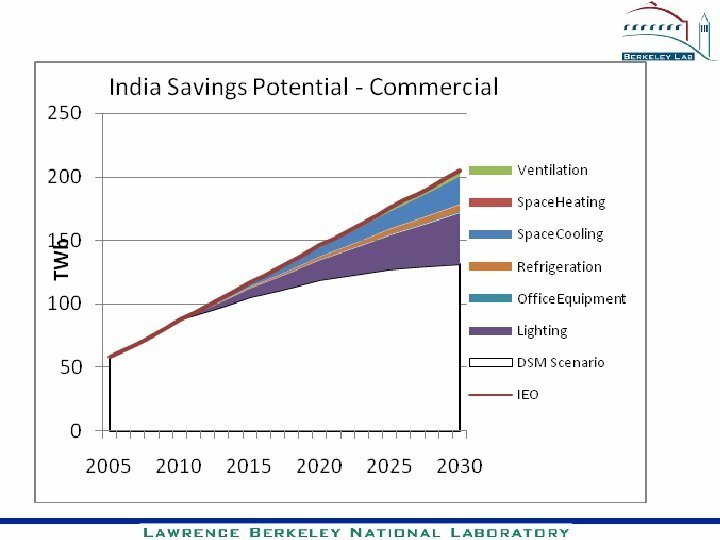 • Saving 400 MW during the evening peak hours at the load end > 500 MW generation at the bus bar • What does it take to saving 400 MW at the load end — Replacing ~ 88 lakh incandescent with CFLs — 45 Watt saving/replacement ; 88 lackh replacements ~ 400 MW saving • How much does it cost — If the utility decides to give the CFLs at the price of incandescent lamps, 100 Rs subsidy needed/bulb — Total expenditure 88 Cr: less that one third of the expenditure of the supply side ! 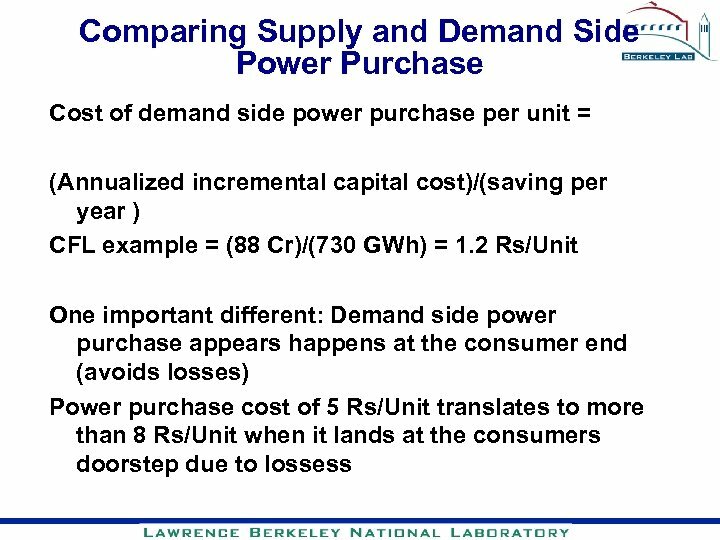 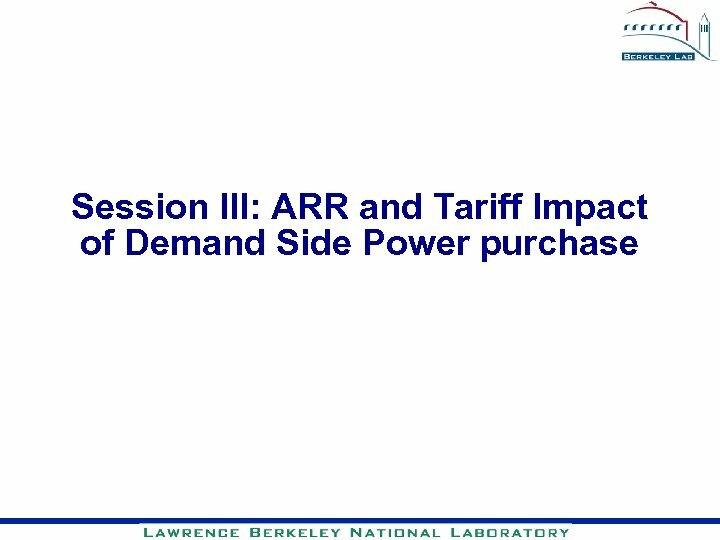 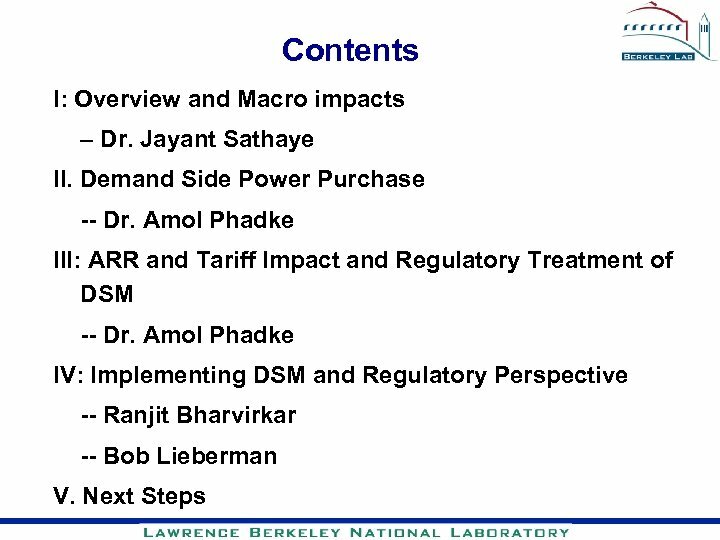 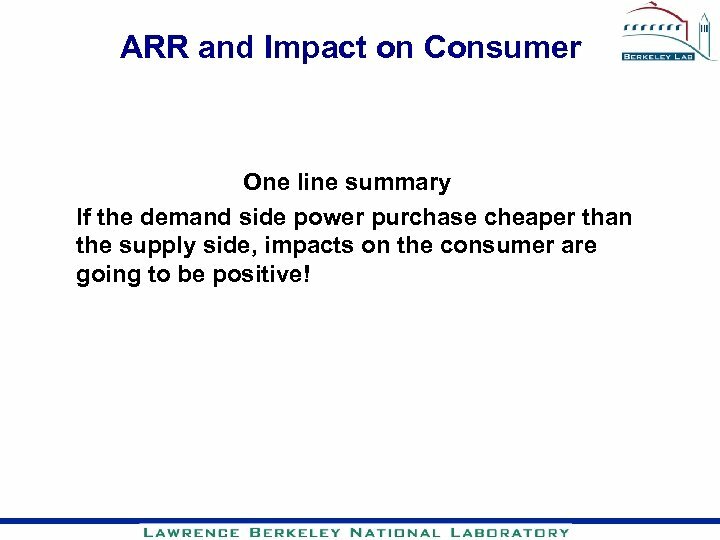 ARR and Impact on Consumer One line summary If the demand side power purchase cheaper than the supply side, impacts on the consumer are going to be positive! 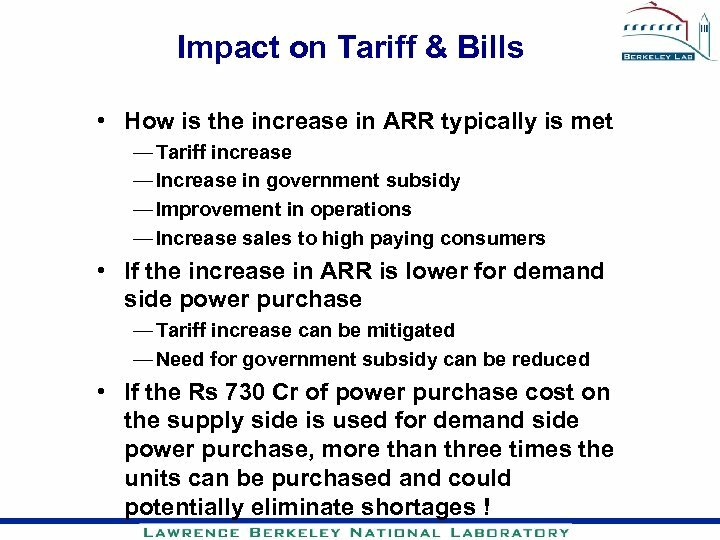 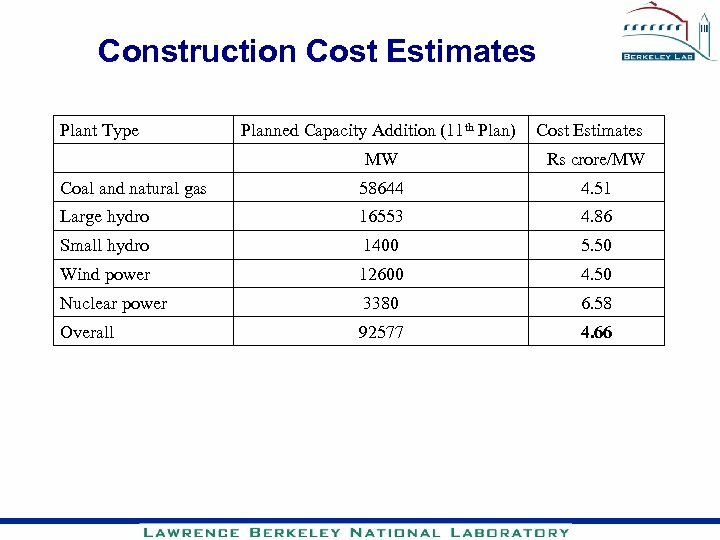 Impact on Tariff & Bills • How is the increase in ARR typically is met — Tariff increase — Increase in government subsidy — Improvement in operations — Increase sales to high paying consumers • If the increase in ARR is lower for demand side power purchase — Tariff increase can be mitigated — Need for government subsidy can be reduced • If the Rs 730 Cr of power purchase cost on the supply side is used for demand side power purchase, more than three times the units can be purchased and could potentially eliminate shortages ! 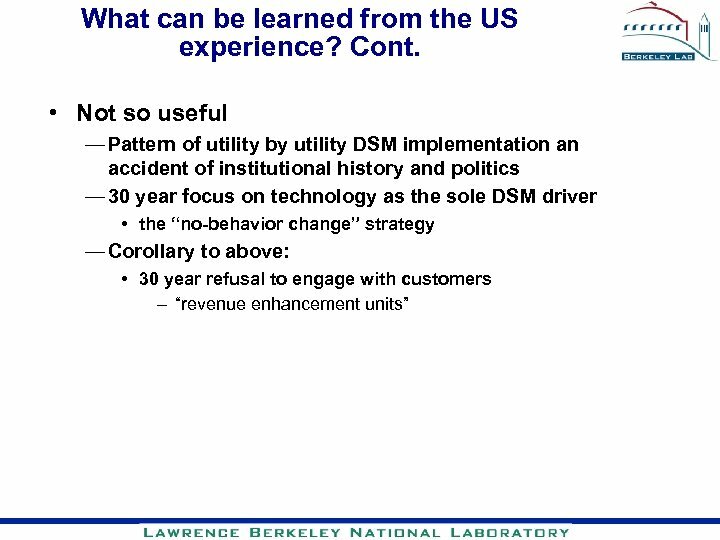 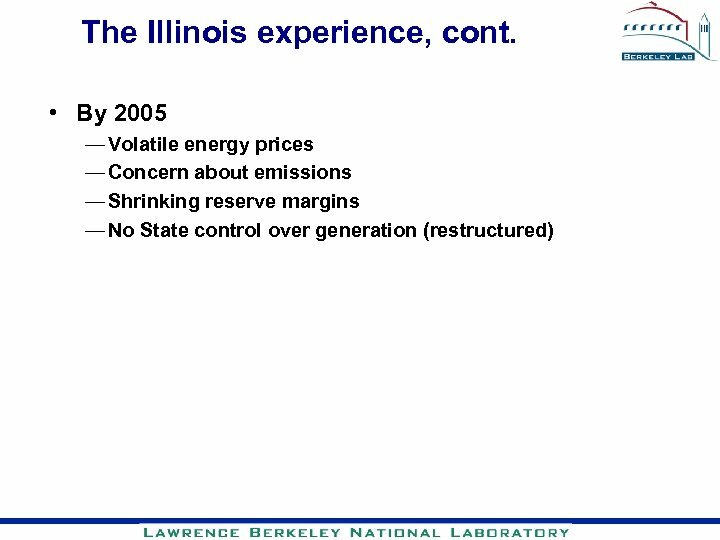 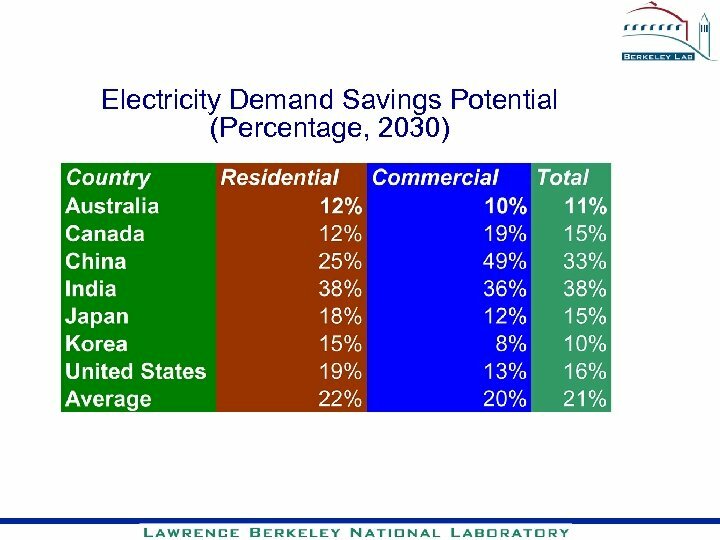 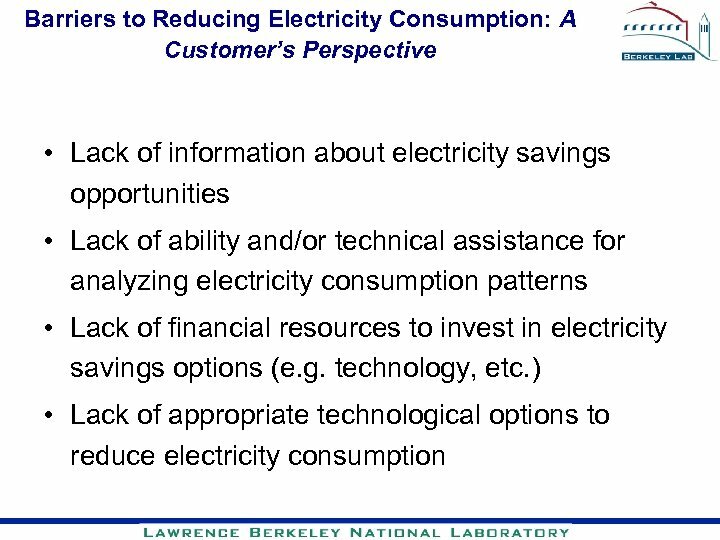 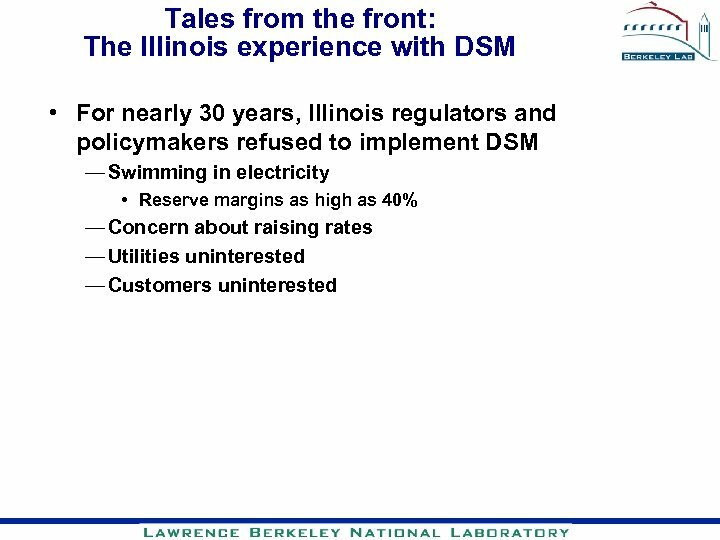 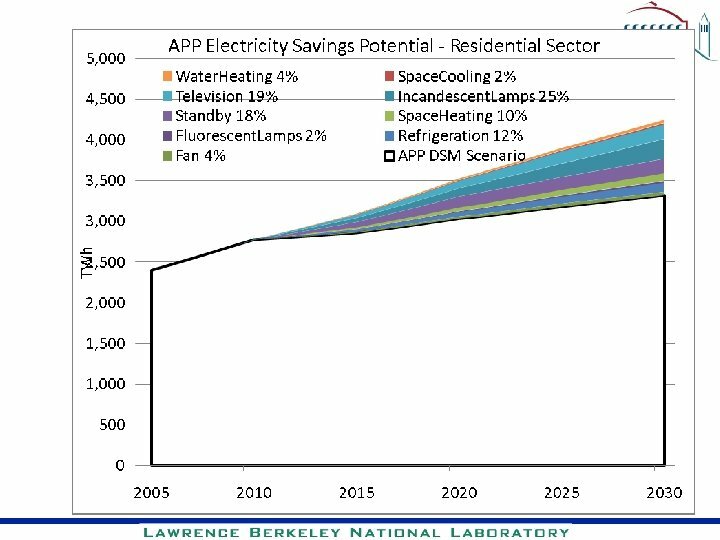 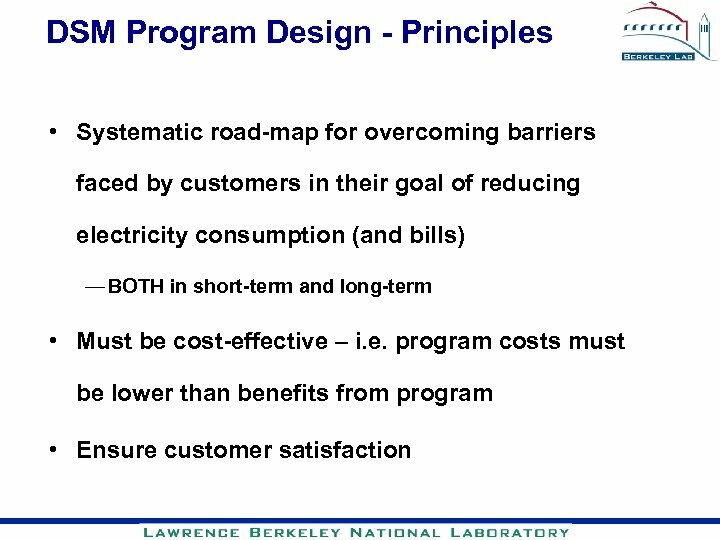 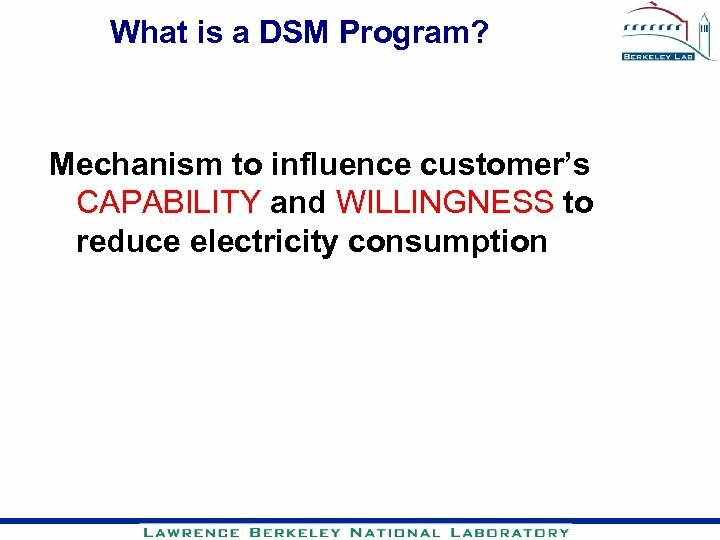 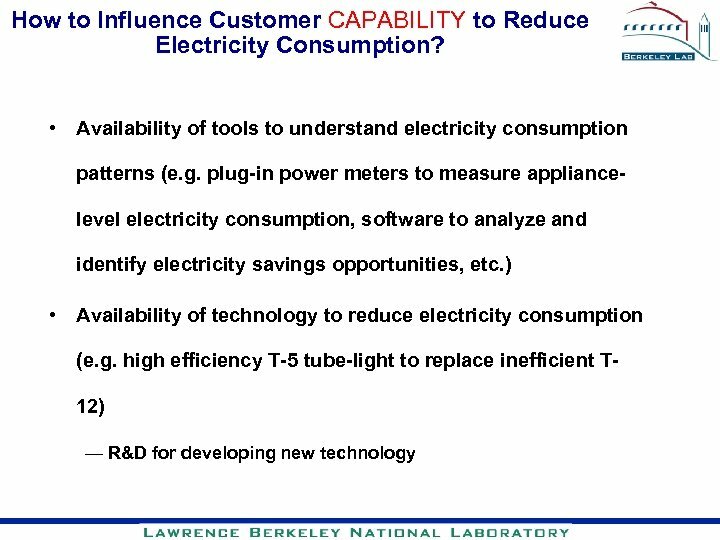 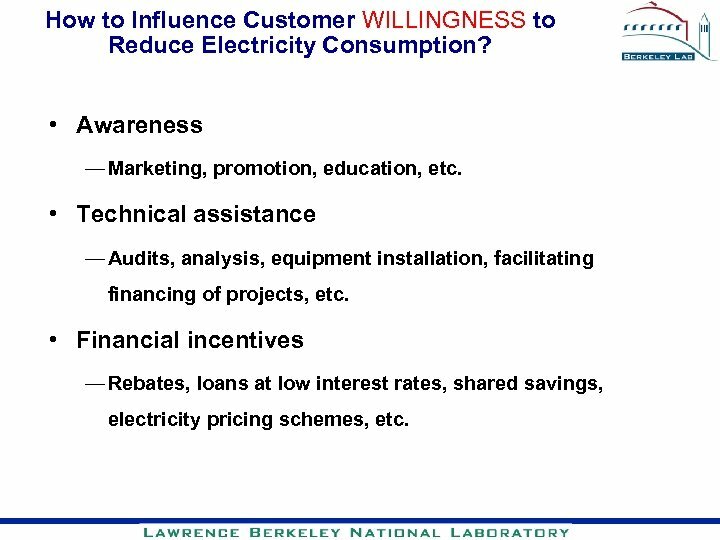 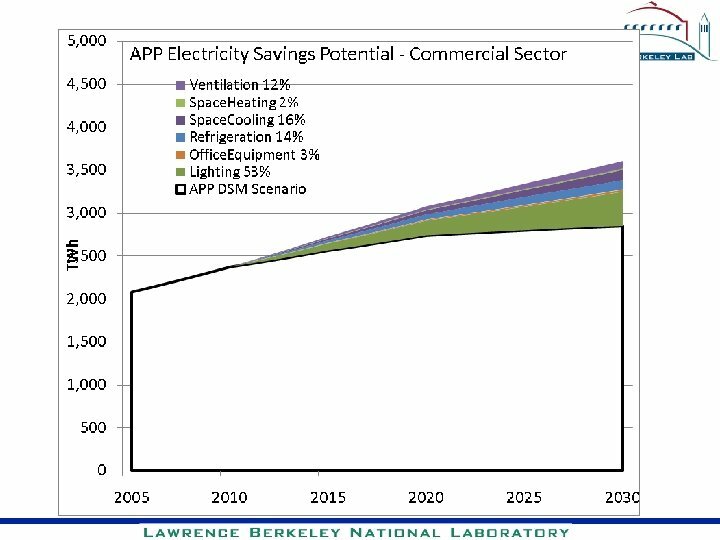 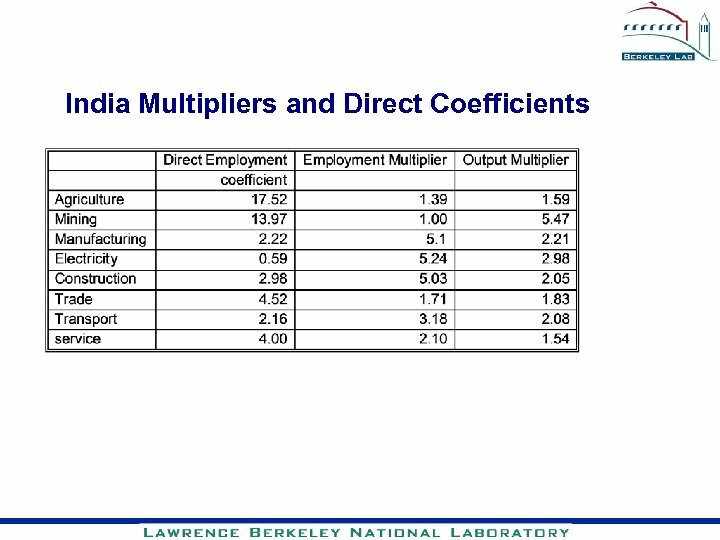 How to Influence Customer WILLINGNESS to Reduce Electricity Consumption? 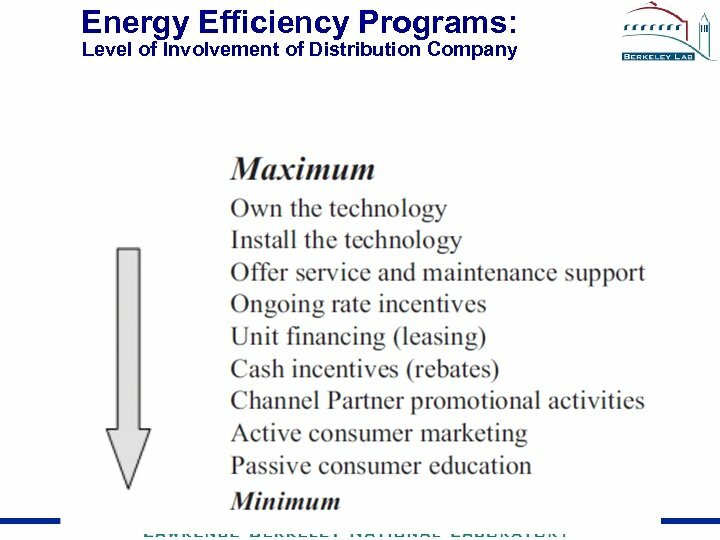 • Awareness — Marketing, promotion, education, etc. 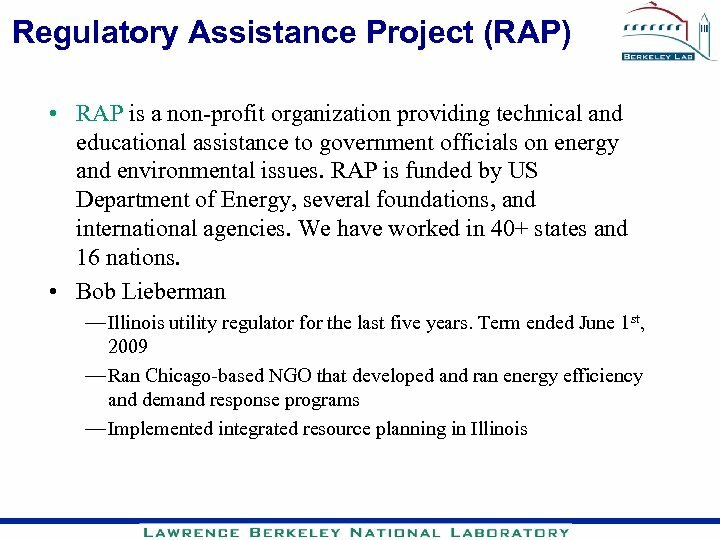 • Technical assistance — Audits, analysis, equipment installation, facilitating financing of projects, etc. 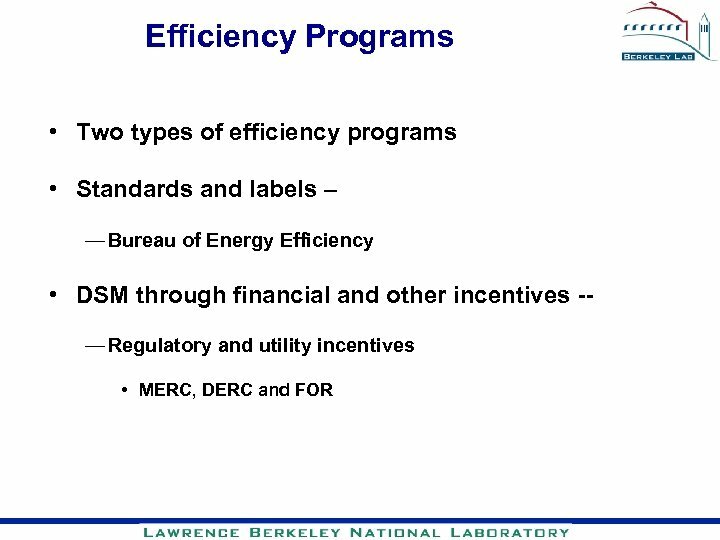 • Financial incentives — Rebates, loans at low interest rates, shared savings, electricity pricing schemes, etc. 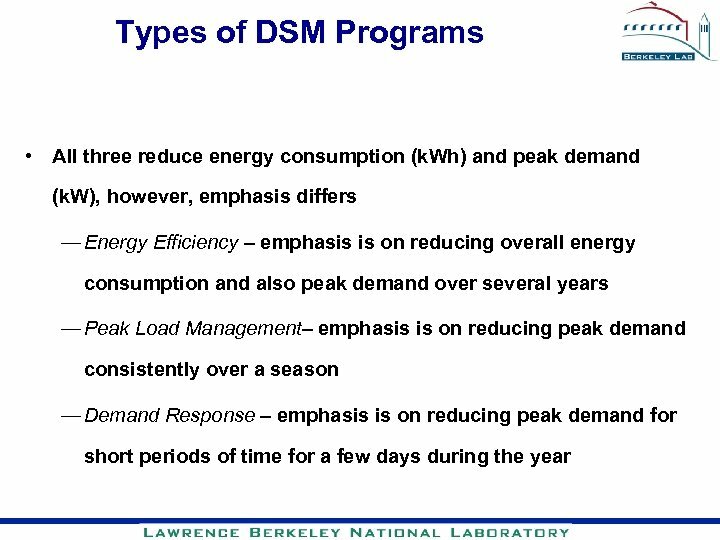 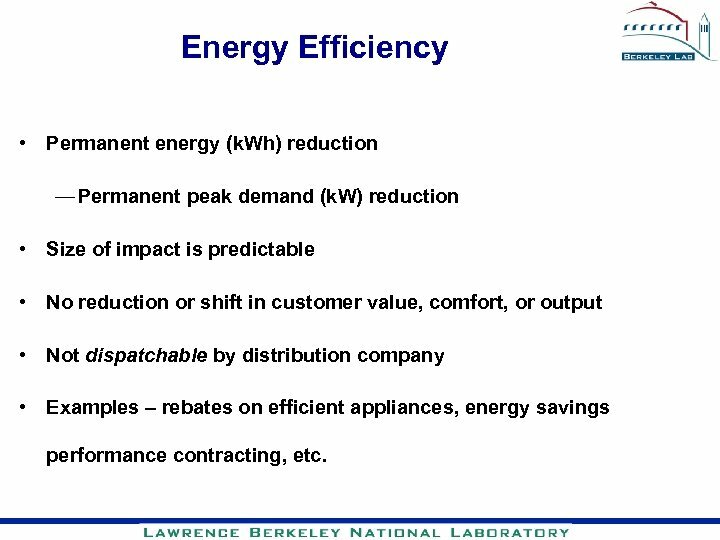 Energy Efficiency • Permanent energy (k. Wh) reduction — Permanent peak demand (k. W) reduction • Size of impact is predictable • No reduction or shift in customer value, comfort, or output • Not dispatchable by distribution company • Examples – rebates on efficient appliances, energy savings performance contracting, etc. 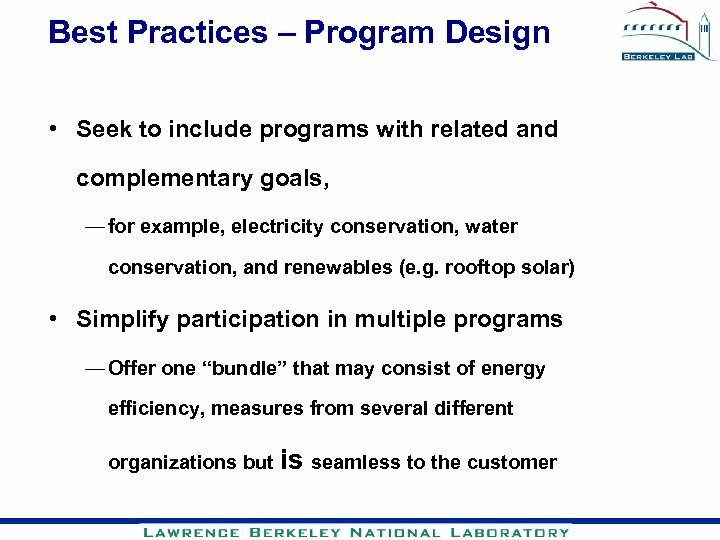 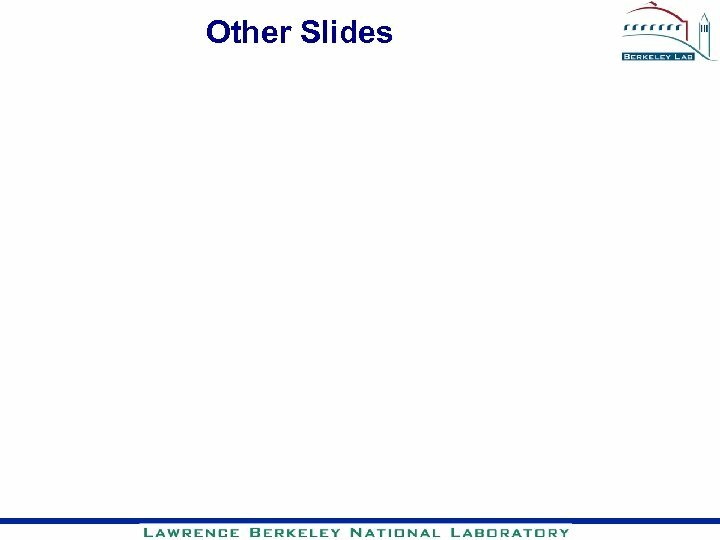 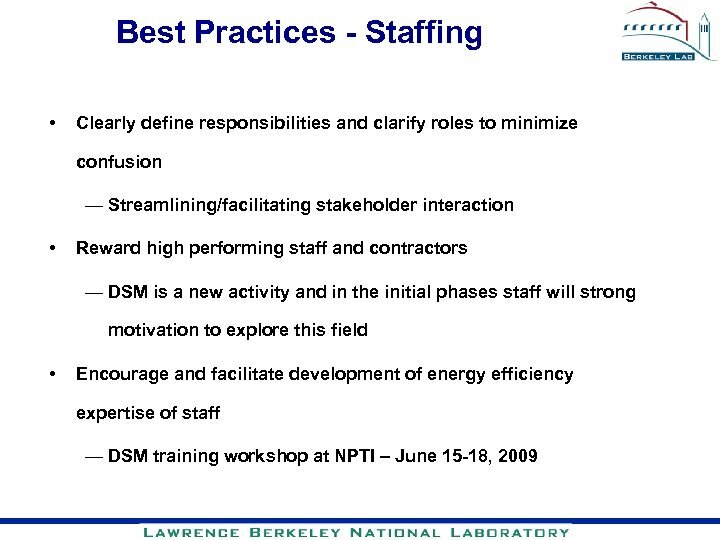 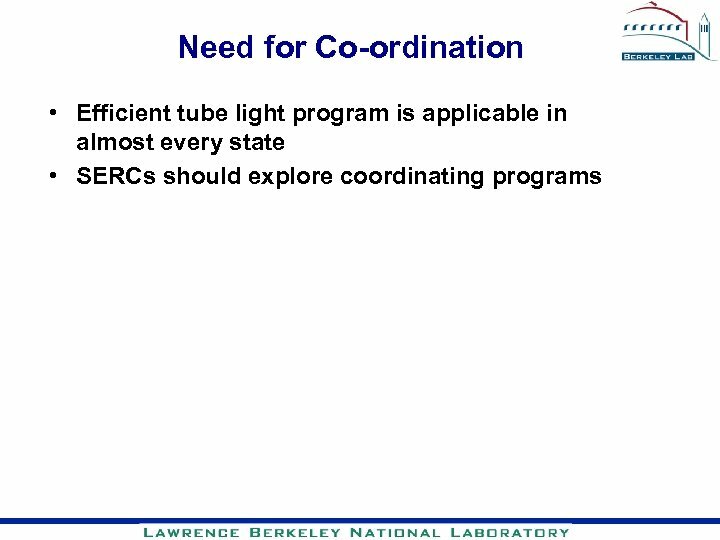 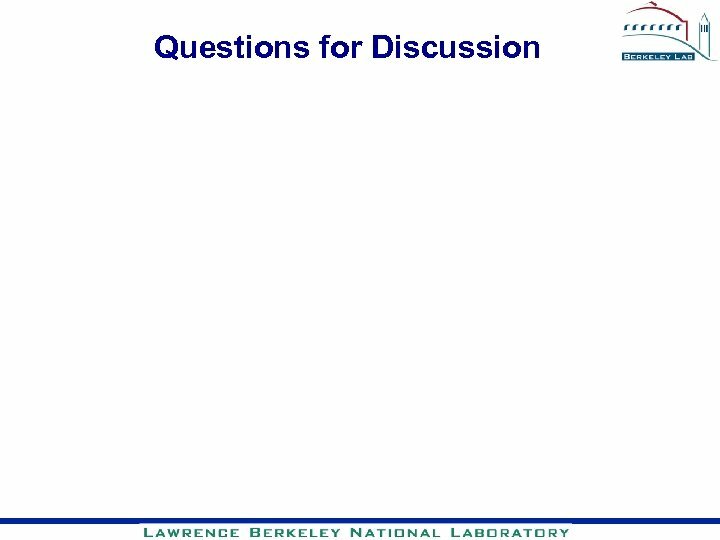 Best Practices – Program Design (cont. ) 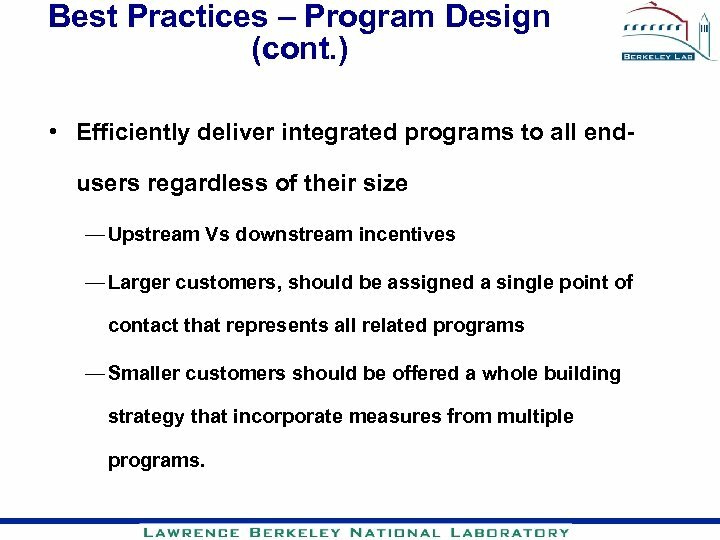 • Efficiently deliver integrated programs to all endusers regardless of their size — Upstream Vs downstream incentives — Larger customers, should be assigned a single point of contact that represents all related programs — Smaller customers should be offered a whole building strategy that incorporate measures from multiple programs.